Oyster are delighted to have adopted Max the blind bear at the Romania bear sanctuary. I fell in love with Max when I volunteered at the sanctuary for three months back in 2009. When earlier this year I was told that I could adopt him, Oyster Worldwide took up the opportunity and welcomed a new member to our growing team! When Oyster decided to adopt a bear, we chose Max because of the dreadful circumstances that he had to live in before he arrived at the sanctuary where Oyster send volunteers. He has captured many hearts during his time at the sanctuary, which opened back in 2007. Separated from his parents before he could even get to know them, Max was blinded by his owners to prevent escape. He spent many years of his life standing outside a restaurant to attract tourists. In 2008 he was rescued and brought to the sanctuary, where he received special care and attention until he started to be able to move about on his own and feed himself. 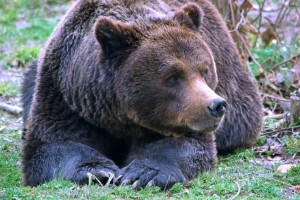 This means that he cannot live with the other bears, but has his own enclosure with a pool in the woods, where he can communicate with the other bears and develop his other senses. Watching him listen for where the food lands in his enclosure, and smell out where it is, is very moving. Upon adopting Max, we received this message, which gives a bit of a background to the importance of being able to adopt a bear at the Romanian sanctuary- and better still, to go and volunteer with them! so many noises of the people walking all around the transportation cage I was in and were moving it, I heard the clicks of the photo-cameras making pictures, I found myself in a foreign place and I no longer felt the heavy collar with spikes around my neck. Everything was new for me: the grass I was stepping on it was so soft and cool and my paws felt so great at their touch as all they ever felt was the rough concrete. The trees and the pool were my enemies at the beginning as they always stood in my way. Now I got used to them and I am happy to have them in my enclosure. Because we were all once captive bears, our organism is not used to hibernate for the winter, but time and the nature chose some bears who can and who already did sleep during the winter. Some of these bears are starting to wake up now from their long lasting sleep during the winter and all they do at the moment is eat and sleep all day long in the great spring sun. Although I haven’t hibernated, I still do what others do. Eat and sleep as much as I can and I am waiting for the day you will come to visit me and the other 62 bears that are currently living here. For more information on the volunteer project that we run in Romania, have a look at our volunteering with bears webpage on Oyster Worldwide‘s website.